I feel like this story needs a warning. The main character is not pleasant. She is not the kind of person you would want to meet, or have anything to do with. I’ll give you a bit of background. 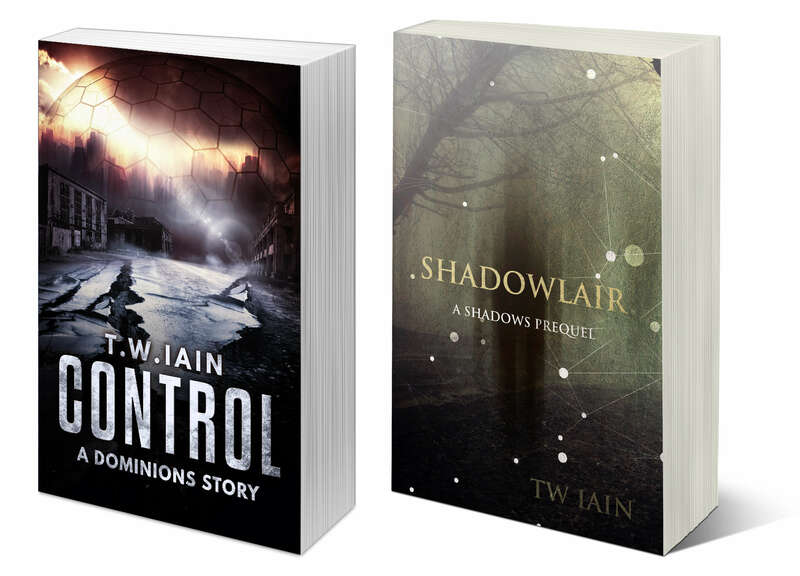 I’ve recently finished writing the first draft of Shadowstrike, the third Shadows novel, and there are a number of new characters in it. One of these is Siren, a woman with a very dark background. I don’t go into too much of that in the novel, but to help me understand her character, I wrote this short story. It made me dislike her more (although I still find her interesting), and as I edit Shadowstrike she may well change. But, for the moment, she’s the horrible person as portrayed in this short story. So if you want something pleasant and light-hearted, don’t read this. And if I haven’t put you off, you can read Predictable by clicking here. I’d be interested to hear your thoughts on this one. For me, book stores pose a dilemma. I love e-books‌—‌the compactness of the devices, the wide range of titles available, the ease with which I can access a whole library of books. I find them easier to read than physical books. Some people say e-books signal ‘the end of books’, but my experience is far different‌—‌since getting my first e-reader (an old Sony thing), I’ve read more and more, discovered loads of new authors, and caught up on classics that I’ve been meaning to read for years. And I still like bookstores. There’s something special about those places, especially the quirky independent ones. There’s an atmosphere to a good bookstore that you simply don’t get anywhere else. I’ll go into a bookstore simply to relax by browsing the shelves. But I don’t buy books in these stores, because I buy e-books. I can’t recall the last time I even read a physical book. Bookstores are disappearing, and it’s behaviours like mine that are part of the problem. Through the way I shop, I’m destroying something special. It’s not me alone, obviously. It’s all of us who buy digital, or who order physical books online. So is this the end of bookstores? Long-term, this is a possibility. Already, some big-name stores have disappeared from our streets, and others are struggling. Yet some still persist, and are even flourishing. There are stores that have found cracks in the on-line onslaught. How do they do this? In the post-Amazon shopping environment, how can bookstores survive? They can’t compete on price. Yes, they can run offers, but they don’t have the margins Amazon have. They can’t afford to be as aggressive with loss leaders. And they can’t stock as many titles as Amazon‌—‌they are limited by their size, whereas Amazon has huge warehouses and (for e-books) seemingly endless storage. But bookstores can compete on specific stock. When I was a teenager, my home town had a place called the Castle Bookshop. It was only a small place, but I much preferred it to WH Smiths just down the street. It didn’t have as many books, but it did have a large selection of sci-fi, fantasy and horror. It didn’t push as many of the big-name chart books, but it had the books that I was interested in. The atmosphere was different, too. In WH Smiths, I always felt that the staff were ‘just doing their jobs’. They weren’t grumpy, or mean, or particularly unhelpful. I’m sure many of them were readers. But the guy who ran the Castle came across as a real book fan. I could picture him enjoying days when he only had a few customers, because that would give him the opportunity to get some serious reading done. And if he offered advice on what book a particular customer might enjoy, it would be a personal recommendation, rather than a suggestion based on what was selling well. Something else I remember about that place‌—‌they had their own bookmarks. They were only coloured card, with the store’s name and logo, and a few other details (address and phone number only‌—‌this was pre-internet, after all.) If you bought a few books, or if he liked the look of you, or for whatever other reason, the man behind the counter would slip one of these bookmarks into whatever you were buying. Yes, it was a way of advertising his place, a way of enticing the reader/shopper back in. But it was also something unique, something special. I had a collection of these bookmarks, and I’d always use them. On the few occasions when I had to use something else as a bookmark, things would feel off. Thinking back to this place makes me feel good. It’s not so much the books themselves, but the atmosphere and the experience. And that is another area where small, independent bookstores, can make their stand. Buying online is easy and convenient, but it is not personal. Even though companies like Amazon use all kinds of algorithms to push the products they believe we will like, based on our previous behaviour (and whatever other data they have), it still feels impersonal. Even if the recommendations are curated by a real person, the connection just isn’t the same. There are many bookstores already carving out their niches, across the world. There are ones that include cafes and restaurants (in a far more integrated way than some big-name stores, where it always feels like the cafe franchise was simply renting space inside the bookstore). The Spotty Dog Books & Ale goes further, combining a bookstore with a bar, where you can browse with a beer. There’s The Book Barge, a narrowboat that travels canals selling books. There’s The Ripped Bodice, a Californian store that specialises in romance books. There’s La Libreira del Mare in Milan, Italy, where all the books are about the sea (the name translates as ‘The Sea Library.) There are stores in old churches, in out-of-the way corners of cities, in the middle of nowhere. There are bookstores for food-lovers, sci-fi and fantasy fans, and mystery readers. In fact, whatever type of book you prefer, there’s probably an ideal store for you somewhere. These stores all complete with the likes of Amazon, not by trying to be better, but by being different. They know their potential customers, and they give them exactly what they want. And the people who run these places do so, I am certain, because they wanted bookstores like these, but couldn’t find them. They are bibliophiles above everything else, just like their customers. Another short story for you. The Illusion Of Control started of as an attempt to write in second person (because one of the great things about writing short stories is the opportunity to explore different things). However, it soon changed, and became something else (read it to find out what). The ending kind of echoes the thoughts in Calum Chace’s book Surviving AI: The promise and peril of Artificial Intelligence (well worth checking out if you’re at all interested in where AI might be taking us), although I wrote the first draft of this story before reading Chace’s book. Anyway, you can read The Illusion Of Control here. And, as usual, I’d love to hear what you thought of it. It seems like every month another retail outlet closes down. The big one recently has been Toys R Us, but there have been so many over the past few years. Initially, people blamed out-of-town shopping centres for the demise of the high street, but now even those places are no longer secure. Things change. It is more convenient to buy over the internet, in the comfort of our own homes. With mobile devices, we can now shop wherever we are, and get things delivered to our doors, or even elsewhere. If we want to buy a gift for someone, we can have it sent directly to them. And on-line stores have limitless shelf-space, so there’s far less chance of hearing ‘sorry, we don’t have that at the moment’. The major player in this is, of course, Amazon. Love them or loathe them, they have changed our shopping behavious, and in doing so have changed both high streets and out-of-town shopping areas. And yet, back in 2015, Amazon opened a physical bookstore, with more following over the next couple of years. On the face of it, this makes no sense‌—‌the bricks-and-mortar stores of their competitors have been struggling (Barnes & Noble), or have gone under (Borders). Yet Amazon doesn’t do anything unless the company is likely to gain. And I believe their intention with these physical bookstores is different to their competitors. I don’t believe they see the primary goal of these stores to be selling physical books. A book store that doesn’t want to shift its stock? That appears to make even less sense‌—‌until you take a step back and look at things in a different light. Consider, to start with, how the books are displayed in these Amazon stores. Your average bookstore will have tables filled with displays of books on promotion, or new titles. These are to tempt potential customers in. There will probably be a chart rack somewhere, clearly displaying which books are popular‌—‌because people like to read what others are reading. And then there are the other shelves, the ones further back that are only browsed by the die-hard readers, or those seeking something particular. Here, most of the books are presented spine-out, with only the occasional book face-out. Why? Because more different titles can be shown that way. The only problem is, covers catch the eye far better than book spines. Amazon stores have the display tables, and popular titles are clearly displayed. There are also racks of other books, only no book is spine-out. Every single book shows its cover. This means that an Amazon store will probably have less stock on the shop floor than a traditional bookstore of the same size. And from Amazon’s perspective, there is a very good reason for this. The main purpose of an Amazon bookstore is to display books. It wants to draw in browsers. The Amazon bookstores are less interested in someone seeking a particular book, and more interested in pulling in new potential customers. In effect, the whole of an Amazon bookstore is a store-front. So does this mean that Amazon are losing those bookworms who scour the shelves for something different, or those who have already read the popular titles, and are looking for more by the same authors? In the physical world, yes. But think again about people’s shopping habits. You’ve probably heard about this behaviour, even if you don’t do it yourself. A reader goes into a book stores and browses the displays and the shelves. A title catches their eye, and they look further‌—‌read the back cover, maybe flick through a few pages. They check out the price. Then they pull out their phone and see if it’s cheaper elsewhere. Maybe, even while they’re in one store, they order the book from somewhere else, to be delivered. It’s not good for the store they’re in, but it’s understandable. They get the book they want, for the best price they can find, and they don’t have to carry it home. Of course, if they want the book there and then, they would have to buy it. Or get a digital copy, and start reading on their phone. Chances are, these behaviours will involve Amazon, at least in the UK and USA. Buying books on-line, both physical and digital copies, has become the norm for a lot of people. So Amazon’s bookstores don’t need to cater to people who read a lot. Instead, these stores are advertising, a marketing strategy to tempt more customers to join Amazon. Even if their physical stores don’t make any profit, the company overall makes enough sales to cover this loss. If the whole store is advertising, the staff have to play a part in this, and everything has to work together. And, from what I understand (living in the UK, I have not been inside an Amazon store yet), Amazon have this cracked. The store staff all have tablets, and can call up information on any book in Amazon’s catalogue (which is close to any book available). They can assist customers in making choices, and if the title is not in the store itself, the staff can order it, even set it up to be delivered to the customer, and all without the customer having to wait at a till. So the customer gets great service, which tempts them back to Amazon the next time they want a book. They might go to the store, or they might go on-line, but Amazon wins either way. There’s one more thing that needs noting about Amazon’s book stores, and that’s to do with Amazon Prime. For those of you who are not familiar with Prime, it’s a subscription service that gives loads of benefits to the customer‌—‌video and music streaming, unlimited access to various books through Prime Reading, free two-day delivery on items ordered, and more. Amazon are constantly expanding the benefits, and one benefit is cheaper prices in their physical bookstores. Maybe that seems unfair to non-Prime members, but look at it from Amazon’s perspective. Prime members generally spend more on Amazon than non-Prime members. They’re Amazon’s super-customers. They make more money for the company, and so Amazon want to encourage more people to join the scheme — through better deals. If a reader learns about cheaper prices through Amazon Prime, maybe they will sign up in the store. It also encourages loyalty. Imagine you’re a Prime member, and you want a particular book. You could get it at any other book store, but you know you can get a discount at the Amazon store. Where are you going to shop? The answer’s obvious. This is why Amazon’s move into physical bookstores is not a straight competition with existing stores. Their stores are giant displays, with helpful staff, and are designed to make money for the business as a whole rather than as a single store. And they are designed to increase customers’ loyalty and reliance on Amazon. So where does this leave existing stores? We’ve seen Borders disappear, and Barnes & Noble are struggling. Supermarkets in the UK now stock chart titles at low prices in an attempt to have a slice of the pie for themselves, but Amazon are the largest book-seller in the world. How can others compete with that? Is there any space for the independent high-street bookstore? I’ve got a few thoughts on this, but I’ll save them for next time. This time, I’ve got a horror tale for you, called It’s Not Murder If They’re Not Human. You can read it here. This is one of those stories that came about through writing whatever was in my mind, without any clear idea where it was going. I was tired at the time, and I had the image of someone staggering into a room, unsure of what was happening, but bleeding. Or they had blood on them. Only as I wrote did I start to figure out what was in the room they’d left. It needed editing of course, and as the story became clearer I rewrote a lot of it. I think only a few lines of the original writing remain. But that’s okay‌—‌sometimes the story only emerges when all the wrong words are out of the way. Anyway, I hope you like It’s Not Murder If They’re Not Human. And as always, I’d love to know what you think of it.